The Quincy Area Safety Council is a proud member of the National Safety Council, the premier provider of defensive driver training in the nation and their courses are nationally-recognized. The National Safety Council’s programs are trusted by more traffic safety courts, motor vehicle departments, municipalities, businesses, government agencies and driving schools nationwide for consistent quality course materials and instructors. 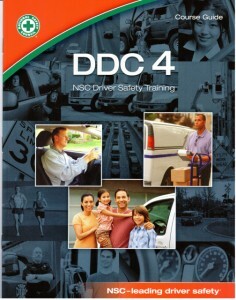 The Quincy Area Safety Council’s Traffic Safety Program is the only authorized National Safety Council training center in the 8th Judicial Circuit (Adams, Brown, Calhoun, Cass, Mason, Menard, Pike, and Schuyler Counties) approved to teach their Defensive Driving Course–4 (DDC-4) and Attitudinal Dynamics of Driving (ADD) instructor-led classroom courses and Defensive Driving Course-Online. Drivers receiving a citation for a traffic violation and requesting Court supervision must attend a defensive driving course pursuant to Illinois Public Act 95-310. Failure to complete a defensive driving course, as ordered, may result in a judgment of conviction against the driver’s official driving record. Conviction may result in suspension of driving privileges by the Illinois Secretary of State’s office and affect automobile insurance premiums. A defensive driving course may be an option available to drivers over age 21 receiving a citation for a traffic violation (as determined by the presiding judge) to prevent a conviction from appearing on your official driving record, which may help you maintain a clean driving record and prevent increased insurance premiums. Consult with your automobile insurance carrier to determine eligibility. Some companies may refer professional drivers to a defensive driving course following a moving violation or traffic accident. The defensive driving course may serve as a means for drivers to enhance their safety record in the workplace pursuant to their company’s policies.